Published May 26, 2011 By Anna T. This post may contain affiliate links. Regardless, I only recommend sites I've researched and/or used and trust. Amazon mTurk (Amazon Mechanical Turk) is a site where you can sign up as a worker and earn money for doing small tasks. The things offered there vary greatly — you might be doing data entry, search engine evaluation, and even writing work. I've personally done all three of those things through Amazon and then some. The way it works is pretty simple: People who need small tasks done requiring human and not computer intelligence can post these jobs up on the job board at mTurk. As a worker, you sort through these jobs, select the ones you want to do, and start for free. Some of the work is fun, while some of it is rather tedious and not really worth the pay. How much does Amazon mTurk pay? The rate of pay depends on the task because “HITS” (Human Intelligence Tasks) pay varying amounts according to what the requester (person who posted the job) is willing to give. The easier, shorter tasks tend to pay the least while the harder, more involved tasks pay the most. But on average, I personally have not been able to make more than $8 per hour doing anything on this site, and on average my rate of pay is probably usually closer to $3 or $4 per hour. The $8 per hour was an isolated incident. Most tasks pay per piece. For example, if you're doing product categorization, you might get one or two cents for each product you categorize. Your hourly rate would depend on how fast you could categorize each product. How and when does mTurk Pay? There are two payment options. The first option is to have your money sent to you via automatic bank transfer. In order to do this, you have to have a minimum of $1 in your account. You can request that the transfer take place at any time as long as you do have that minimum amount in there. Second, you can receive money toward your Amazon gift card balance. I think this option is great because mTurk is just extra money online. So because I don't ever get a whole lot at once, it's no big deal to just transfer what I do get over to my Amazon balance and use it to go toward stuff I buy from there. You only need to have $1 in your mTurk account to transfer it over to your Amazon balance. Are all tasks available to everyone? No. Even though you can sign up to do HITS on mTurk without taking a test, you can't necessarily get access to all the jobs without first qualifying for them. Some HITS require that you complete qualification exams, while others do not. The requester generally creates these tests to ensure that the people who accept and begin working on their HITS have at least some knowledge of how to do them correctly. In most cases, you're given clear instructions prior to testing, so it's likely you'll pass if you studied. Does Amazon mTurk allow people from outside the US to work on HITS? Yes. I know that people from India can work on HITS as well as other countries, but unfortunately Amazon does not have the names of other countries listed. If you're a US citizen not actually living in the US, you cannot work on HITS. US citizens should receive a 1099 at the end of each year from any requester for whom they do more than $600 worth of work for. People who reside outside the US will have to file their taxes according to rules set forth by their country's tax authority. How does mTurk monitor quality? Each requester will take note of your quality, and they are free to reject any HITS you work on that aren't up to their standards. Unfortunately, incorrect HITs don't qualify for payment. On the flip side, your requester is free to give out bonuses to above average work, and some of them do take advantage of this feature. If your overall quality goes down on the mTurk site as a result of doing a poor job on HITS, you will find that you can't work on as many different projects because your quality score will decrease and some HITS require minimum workers to have quality scores in a specific range before they can accept anything to work on. I honestly don't do a lot on mTurk because of the seriously low pay. Although I realize some people do OK here, I can't recommend it as a good, reliable source of income. Another thing I don't like is that sometimes requesters will reject some of your work without an explanation even though you feel certain that you did everything right. And of course you receive no pay for those HITS. Unfortunately, some requesters are very dishonest and will intentionally not accept all your HITS just so they don't have to pay you for everything. This is a chance I don't like taking, and it's another reason why I don't do much work here. Despite all this, I have been paid for more HITS than I have not been paid for, and I do think it's a good way to earn a little extra Amazon money here and there. One of my favorite things to do on Amazon mTurk that I find to be worth the time are the mTurk surveys. If you want to do work on mTurk but you're concerned about dishonest requesters, I highly recommend you check out Turker Nation. It's a forum created by people who regularly do work on the mTurk site, and they have threads up that you can read to find out which requesters are best to work for and which ones you should avoid. How Do You Get Started on mTurk? If you want to go sign up for mTurk and either make yourself a little extra money or some Amazon money, you can go here to do it. When you get to the page, just click the link on the left to sign up as a worker. Want to Learn More About How to Make the Most of Amazon mTurk Before You Start? Jim Bradley has a highly-rated 3-part eBook series on making a go of Amazon mTurk. The fact is, despite the low pay, many people are able to turn this into a profitable side earner for themselves. You just have to know which HITs to look for and how to complete them properly. The eBook, “How to Make Money on mTurk – A Short Beginner's Guide to Making Money From Home In a Week or Less With No Starting Income” is low-priced and highly rated. This is probably worth a look if mTurk has piqued your interest. I have been working for mTurk for a few years now. While some of the work can be tedious and low paying it does pay. They also have some higher paying jobs that you have to qualify for but once one pass the test you can make hundred or more dollars a week if you put in the time. I mostly do transcription work, it can take a while and you have to have a good ear for it but it pays okay. Also I have discovered, over time, that a lot of the companies that continuously offer HITS have their own websites that you can sign up for to get even more work, at least in the transcription areas. Overall I would not consider this by itself a single source of income that will sustain you for the long run but it is a fairly steady source of small income. If you add it in with some other jobs it can add up with time. usertesting is a great one and ive made really good money on there..the survey questions in blue at top on dashboard I allways fill out and have gotten chosen for many extra tests that always ay way more..i made 200 recently on one that I just answered 10 questions a day for 2 weeks! theres others similar to it as well..like usertesting, Uterlytics and about five others..pennyhoarder and moneytalks are great sites that daily give you these sites and alot more! they also review each one ahead of them and give you all the details…great post..never jnew about this so I appreciate it! Ive been doing all the work at home I can during the day and late night hours as ive been going through cancer and unable to make any money..alone with 4 kids and need every extra dime I can make..great post great info and I see you reply to everyone so honestly too..great job! Thank you for the feedback, and good luck to you! Mturk is great and all, but they seem to be suspending a lot of people’s accounts. Mine’s been suspended for a few months now. When I called they wanted me to fax in my social security card, driver’s license and a bill. I understand why, it’s to prove that you are who you really are, but just be cautious, because they will want a lot of your personal info, and they want it faxed. Which in today’s day and age, I don’t even know how to find someone who owns one anymore. They are a good way to get some side cash, though, last year I was able to earn a little over $500.00 for Christmas gifts. Mturk is my favorite- between 9am-5pm eastern you can set your parameters and find some nice $2-3 studys and surveys. I still use Swagbucks and others for videos- I keep a side computer going so I can make a few hundred extra. Turk has a limit- even if your willing to work all day there’s only so much you can squeeze out of it when its not prime hours. I signed up a few days ago on a whim and I like it so far. I think it’s a good way to make extra money for things you may need here and there. I’m doing mostly surveys and I definitely suggest using turkopticon to check a requester out before you decide to do a task or not. I’ve been able to make $5 a day just spending an hour or two doing surveys and batch tasks. I’ve got my eye on something extra I want to buy and if I can keep this going, I’ll be able to get it by the end of the month. No complaints so far. I think you’ll enjoy it more if you go into it understanding it’s not a part time or full time job, but an extra cash gig. I’m sorry to hear some have been having problems with Amazon MTurk. I personally have been with them a while now and I really like it. It’s a good earn a few extra bucks when you need it or a part time job depending on how much time you want to put into it. It has saved me on a few occasions when I needed extra money for something that came up. The tasks pay all different amounts and you pick what you want to do. I stick with the ones that I can complete quickly and pass on other ones that will take me too long to do. You have to kind of experiment to see what will work for you. I wouldn’t by any means consider this or try to do this as a full time job. There usually aren’t enough tasks that I can do to be able to do that but it does make a nice part time job for me when I do it consistently. I have been very happy with them and always get responses to any problems I might have. of time for such little pay. Stay away from this site, it’s not worth the trouble. I tried to apply to Amazon MTurk but got denied. Doing some research I found out that they are not accepting people from outside the US anymore. (I’m from Brazil). It’s a shame, but maybe they open again worldwide some time. I’ve seen a lot of praise for MTurk and decided to finally give it a try, only to get denied and given absolutely no reason why. Vented to a friend who told me they also got denied. So from my experience, nobody can even start at this point. I just applied 2 days ago and received and email today saying that they “regret to inform me that i will not be permitted to work on Mechanical Turk.” They continued with this statement, “Our account review criteria are proprietary and we cannot disclose the reason why an invitation to complete registration has been denied”. What in the world??? Complete waste of time and very frustrating. You are allowed to work on a sample question to see what each job is like but…one requester had a button to click to get instructions but instruction page was blank. Another one has a fill-in-the-blank demo but as I filled it out there would be a flagging system warning you when you put in an incorrect answer and telling you the proper answer. All fine and good except the “wrong” info I was entering was exactly the same as what they indicated was the correct answer – so you are stuck since you cannot move on as their system does not register your answers properly. Another one I spent 5 minutes reading material as quickly as possible, even skimming at times and then review it in several sentences. By the time I finished the review, however they cut me off for not being fast enough. Did this several times with ever faster skimming and still they cut me off. Another one had you looking for certain info and typing it into a field. After typing it in, however, the “enter” field was grayed out so I could not click and submit my work and instructions were flashed up on screen for me to follow the requester’s instructions for submitting the work. Well, I went back to the instructions and there was no special instructions on how to submit your finished work which implies your click the “submit” button but it would not let you do that as it was grayed out. There are more such fiascos but suffice it to say I spent 5 -6 hours over several days fighting with glitches and BS as described above getting dead ends everywhere. I earned a total of 6 cents for my 6 hours of frustration. Has anyone been doing any work for them? How has it been going for you if you don’t mind sharing? I haven’t done any work for them in a while and was thinking about getting back to them since one of my other jobs fell through recently or until I find something else. I’ve actually earned a lot of money with mTurk. Although the University surveys pay REALLY well, you should go for the private requesters. For example, I was working on an advertisement project for a particular requester. This requester emailed me personally and ask if I would like to work on any more task that was similar to this. I agreed and I was earning at least $10 ever day. The project only lasted for a month, but I earned around $300 by the end of the month. It was fantastic! Thanks Maam. I’m living here in the Philippines. Do they accept workers here in the Philippines? A good tip for people not living in the US. 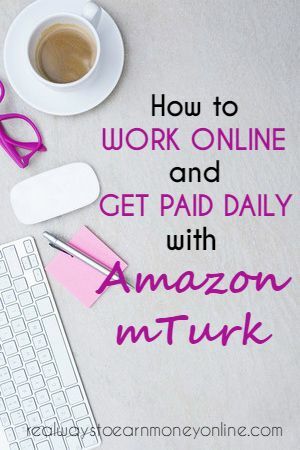 Start making money with turk…and save them up on the amazon account. Then when youve gathered up a bunch of money…go look for a product you can sell on places like ebay, or an ebay like site that is local. i have 3 sites in my country that works just like ebay. Buy a Digital camera fx. with your money..recieve it in mail…and resell it..often you can resell things for more than the amazon cost. Does anyone know if Mturk and CrowdSource are directly related? I have done tasks on Mturk and some were for Crowdsource. After doing a few, I got an email from Crowdsource welcoming me to their site. It showed I have a balance with them, though I never signed up with them. So, my question is I guess, do they both pay then, or would it still be strictly through Mturk. I have seen Crowdsource on another site I belong to under tasks as well. So, I’m trying to figure out my confusion. LOL! I don’t know much about CrowdSource so I’m just trying to find out the bottom line. Thanks! I can answer your question about CrowdSource (CS). I Turked regularly from September through October and got one of CS’s major quals, and I’m looking forward to getting back to working with it soon! CrowdSource is just one of many requesters on Mechanical Turk. Because Turk is just a marketplace where workers find work to do from requesters, by doing any of CS’ HITs, you effectively “signed up” with them. 🙂 You never work for Mechanical Turk—they are sort of just the virtual location where you find work. So the work you did was for CrowdSource, and their site that you saw was the site that CrowdSource runs for its Turkers, to be able to view more detailed stats on their performance. By the way, Anna, good post! I’d like to recommend MTurk Forum (mturkforum.com) also; they are a pretty active Turking forum as well, and I’ve been impressed with how much information there is over there. Thanks Amy! I appreciate the insight and also the link to that forum. I have been working on Mturk for about one month now and I have made close to $80.00. My best day was when I made about $14.00 in less than an hour. This is a good site to do University surveys. I try to do surveys that pay .50 and over. Some are short and some can be about 20 minutes. I don’t do many hits where my work can be rejected, so doing the surveys have gotten me paid the quickest. I have been able to spend some money on Amazon.com and then I sent the rest to my bank account. I will continue to do this for some extra spending money. Thanks for a great site. I am still going though your pages. I have signed up to do the website testing and have taken 2 tests tonight. I love MTurk too. I did one of the survey ones and it paid well for just answering one question. It also got approved fast. So glad you like the site and that the user testing is working out for you! Thanks for stopping by! One of my friends works with MTurk,and she has built up enough of a reputation there and gotten high-enough-earning projects that she’s able to make at least $15 an hour, occasionally $20 an hour. You just have to really stick through possibly months of only making $4 an hour. Whether or not that investment is worth it, and whether or not you’re speedy enough, are all factors in whether or not you might be able to earn that much. Wow I didn’t know it only took a $1 for your Amazon account! I have to admit, I haven’t shopped at Amazon yet but I do love some of the deals on there! I wonder if the money expires after a certain time though. I might have to check into that! I think over like 2 1/2 months, I have only made up to $4. I don’t get on there as much as I use to! I love the fact you are always completely honest about these work at home sites. I hate when I read where someone claims to be making hundreds of dollars at something, then when I start I am only making pocket change. I get so excited for nothing. I appreciate when someone is honest and doesn’t leave me with unrealistic expectations. I think you just inspired my next article! I know what you mean! There’s been so many times I’ve got into something thinking I’d make incredible money with little effort only to find out that I’m not even getting minimum wage. I think what it boils down to is that no matter what you do, you HAVE to put the work in to make a substantial amount of money, and if it sounds too good to be true, it usually is. I think it’s important for people to know what to expect before they get into something so they can decide if they’ll be wasting their time or not.